Bar Harbor is one of Maine's biggest tourist spots, drawing thousands of visitors to its shore each season. However, many would argue that Acadia National Park is the real highlight. Considered the "crown jewel of the North Atlantic Coast," by the National Park Service, this rocky recreation site brings together two of nature's most beautiful wonders: the mountains and the coast. Located on Mount Desert Island, Acadia boasts seven peaks and more than 150 miles of hiking trails. One of the best parts about Acadia is that it's filled with so many day hikes, you can find a new path to explore every time you visit. According to Travel + Leisure, Gorham Mountain Trail is one of the top five best routes. Scattered along this trail are areas that peel off to ancient sea caves, providing a glimpse of history. Though the summit doesn't reach the level of 1,000 feet like some of its counterparts, it provides a breathtaking view of the ocean below. For a steeper climb and shorter mileage, check out the Cadillac North Ridge Trail. If you're a sunrise chaser, this hike is most definitely for you. The top of the mountain is the very first place to see the sunrise on the east coast. Plan to hit the trail head at least two hours before sunrise for the best views. You can set a timer on your PRW3510Y-8 Pro Trek Watch to ensure that you're in the right place at the right time for the sunset. As the NPS explained, Acadia offers hikes along the coastal sea cliffs, through the woods and out to the Schoodic Peninsula. The more than seven miles of Schoodic Hiking Trails offers a little bit of everything in one. You'll get both ocean and greens like spruce-firs and pines along this route. You can begin at either Blueberry Hill or the Schoodic Woods Campground. As U.S. News & World Report Travel explained, the options for exploring and adventuring in this 47,000-acre park are innumerous. Thrill-seekers can spend an afternoon rock climbing or mountain biking the rocky trails. Flora and fauna enthusiasts will enjoy the wide range of plant species and opportunities for bird watching. And both novice and professional photographers will find endless shots and frames, especially during that golden hour. In addition to hiking, many people choose to camp throughout Acadia. It is advised that you make reservations in advance if you plan to pitch a tent at the end of a hike as each campsite has limited space. Finding availability - especially in peak season when the weather is good - is not that common. As with many New England destinations, summer is the busiest time of year. During the warm months, the popular and relatively easy hikes will be quite crowded and accommodation availability tends to be booked well in advance. You may beat the crowds by booking a trip in the spring, but as U.S. News & World Travel Report explained, March through May is known for rainy, foggy weather leaving you with below-average hiking conditions. 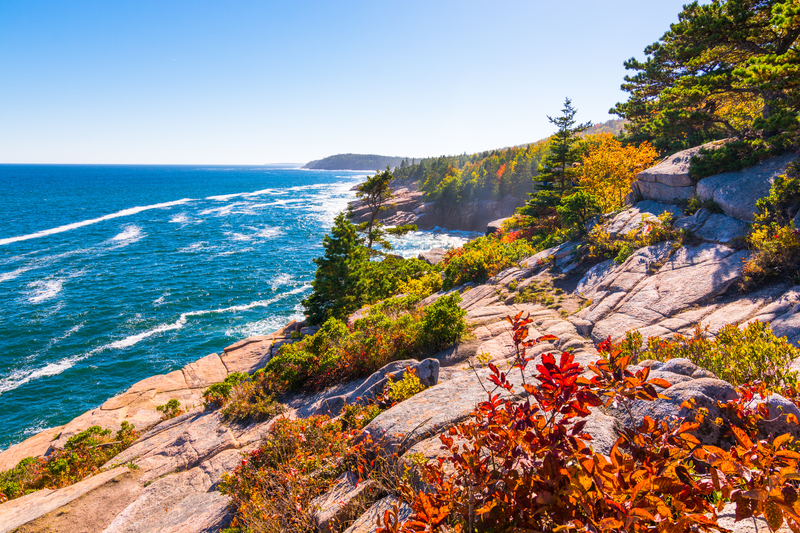 As a result, September and October are two of the best months to visit Acadia, according to the source. The temperatures are generally mild and have yet to become too cold and you'll have a lot of trails to yourself. Best of all, this is when the leaves begin to turn those breathtaking shades of vibrant yellows and oranges, enhancing your outdoor adventure. Your trip to Maine wouldn't be complete without lobsters and blueberry pie, two staples of state's population comprised mostly of fishermen and farmers, according to Our Acadia. Enjoying a traditional seafood dinner after a long day of hiking is the best way to get a taste of the local fare. You don't even have to leave Mount Desert Island to indulge, as some of the areas best restaurants are located here. Be sure to try the lobster and seafood stew at Jordan's Pond House and stop at The Burning Tree for local crab cakes and the mussels in a zesty coconut broth. A late summer evening meal isn't complete without an ice cream cone of course. Get yours at Mount Desert Island Ice Cream. After your adventure through Acadia, enjoy a refreshing drink on the water in Bar Harbor.